This time I'll be presenting you a pony tail with invisible hair-tie. 1. Make a sleek pony tail, but leave a little hair out. 2. Take the pony wrap. 3. Put it in your hair-tie, in the middle of your hair. 4. 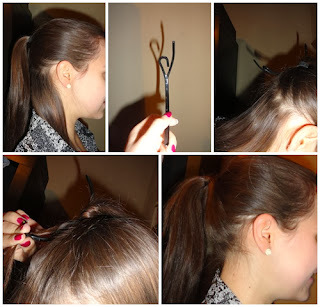 Turn the strand of hair that you left out in (1) around the hair-tie and in the loop. 5. (Not really on the picture but nevertheless:) Pull on the other side of the wrap, so not at the side with the loop and tadaaaam! What is Bloglovin'? Read about it here!